Such is the fickle landscape of chasing..."The next big thing"
Waldeck's group, Earth to Andy and Farrell's band, No Soap Radio had crossed paths while touring in support of their respective major label debuts. A mutual respect developed, which brought these two songwriters together for this new collaboration. As the first few songs came together it was clear that something very special was happening. A perfect blend of modern rock and pop fusing together in undeniably hook laden songs. Underground All Stars was born. For over a year the songwriting progressed and more new musical gems uncovered. It was time to head into the studio & record their debut cd, titled, "People Are Stars". Every song on 'People Are Stars' is an experience in life that the listener can relate to in their own way. The undeniable vocals by Andy Waldeck are backed up by the rich, dark & rhythmic textures by guitarist Jimmy Farrell. Bassist Crix Reardon supplies the rumble in your gut along with the vocal harmonies that deliver a polished, yet indie sound. Guitarist Mike Maino captures the attention of the audience with melodic & emotional leads that are far to often missing in songs these days. And when it comes to getting pulled in by the heartbeat of the band, drummer Chris "Cujo" O'Hara delivers. 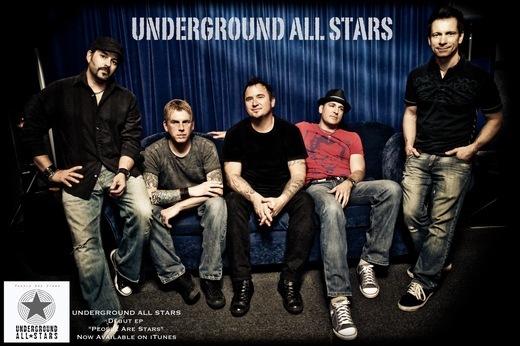 "This is going to be a great year for Underground All Stars" says guitarist Jimmy Farrell. "We've done lots of great things on our own. I can't wait to see what we do together!". With gold records, major television and film placements and A-list studio sessions to their credit, it's easy to understand his excitement.